Are you looking for a toilet that has a host of modern features, but doesn’t come with an extensive price tag? Do you want a reliable toilet that you won’t have to worry about replacing in more than just a couple of years? The Kohler Wellworth might be one of the most affordable toilets on the market today. Being sold on Amazon for less than $300, it still has a durability that is better than toilets that cost twice as much! It has clean, simple lines for that elegant look you want in the bathroom with a reliability upon which you can depend. Be sure to also look at the Best Kohler Toilets Reviewed page as well! What Kind of Features Does the Kohler Wellworth Have? Owning the Kohler Wellworth is certain to be a pleasure thanks to the design of the trip lever. You read that right, but that’s because the lever gives you a dual flushing option that will help you save even more water. You can flush liquid waste away with a turn of the lever so that you get a 1.1 gallon flush. Turn the lever the other way and you’ll get a 1.6 gallon flush for the bulk waste that needs to get flushed away! it offers a bulk level of performance that will help to flush away up to 4 times the amount of waste that the average adult can produce. The primary benefit, however, is in the cost savings that you’ll experience. 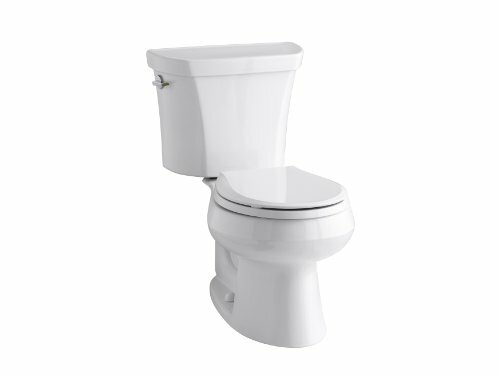 For the average dual flush toilet, a home owner can expect to save right around $100 per year. In practical terms, that means this toilet will pay for itself in 24 months and you won’t even recognize the difference in the weekly maintenance chores you’ve got to perform. Is There an Advantage to Owning the Kohler Wellworth? The primary advantage of owing this particular toilet comes with its clog-free design. Although any toilet can be clogged, especially when foreign objects are trying to be flushed by little hands that love experimentation, this toilet will work are to prevent it. The flushing process on this toilet is intuitive and helps to create a virtually effortless ownership experience. Even the top of the tank is free and flat so items can be stored on it! Outside of needing a seat for this toilet, there really isn’t anything negative to say about this toilet. It works with a standard 12 inch rough-in, could work for a 14 inch setup if necessary, and installation is a snap. For all of those reasons, this incredibly affordable toilet receives our highest recommendation because it provides a tremendous amount of value for a very good price. Click here to compare prices on Amazon and get the best price on the Kohler Wellworth Two Piece Toilet.